When I am away from home and can’t sleep I do a mental tour of the garden – a bit like counting sheep – and it never fails to do the trick! After a big trip overseas to the UK and Greece, it was great to get back and find how much everything had flourished but, for the first few days, because of all the unseasonal rain they had, I had to curb my itchy feet and fingers and stay indoors because the ground was like a quagmire. 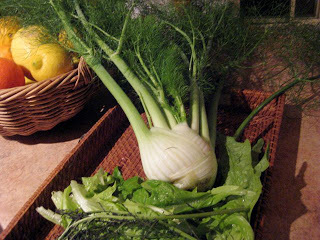 One of the things I had to harvest straight away was this beautiful fennel. I recently invested in a mandolin – not an instrument for duets with my ukulele, but a very sharp bladed tool for slicing things thinly – just what you need for fennel, but you have to watch your fingers as it is lethal (get one with a guard!). 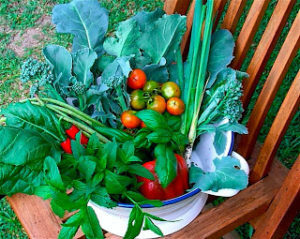 It is easy to grow through the colder months – being used as a late winter vegetable either fresh or braised. Just plant seedlings (seeds are easy to grow) in late summer in an old composted bed – it won’t need any feeding after that – just keep well watered and harvest when the white bulb at the bottom is thick and fleshy. NOTE: ‘Bulb’ fennel is also known as Florence fennel or sweet fennel and not to be confused with the straight species Foeniculum vulgare – an aromatic, rather weedy herb fennel which shows no swelling at the base; can get to over 2m and grows wild all over Europe. A familiar sight in Greece is to see folk (usually men) scouring the hillsides for ‘wild’ greens (horta) and herbs like fennel – they use it for cooking particular dishes – think cheese pies with fill pastry! It’s a prized vegetable in many parts of Europe – cropping up in lots of Italian, French and Greek cooking. It’s crunchy, sweet, aniseed flavour goes well in green salads or sliced with oranges – Italian style. Anything with these kind of flavours and fibre is very good for the stomach – I can guarantee that you will feel great after eating a meal with fresh fennel in it! 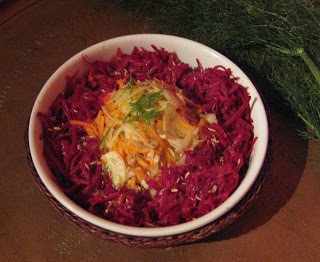 Fennel, Carrot and Beetroot Salad: This is something I have eaten with fish in Greece. It’s simple to make with crunchy, fresh flavours and with beetroot, carrots and fennel being plentiful and cheap at this time of year, a good late winter salad. NOTE: I also thinly slice fresh fennel over a salad of tomatoes and olives with a simple olive oil and lemon dressing. Fish and fennel are also great partners. 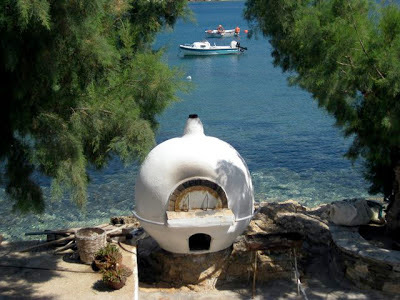 Sifnos, an outdoor oven perfect for cooking up some red mullet!